We’re so focussed on fulfilling orders, updating the store and getting ready for conventions that we sometimes miss fleeting mentions of our product. I’ve been multi-tasking the last week, working and listening to podcasts – a catch-up on good material missed. I have plenty to get on with in that respect; right now, it’s the turn of Baz and Gaz’s What Would The Smart Party Do. I’m having a whale of a time listening because I’m over the same generation. I started collecting at the beginning of the 80s (while knee high to a grasshopper) and have a strange balance of trad and indie games scattered about. The duo has covered a wealth of material in the 10 hours they’ve recorded so far, from handling problem players and the awkward demands of social conflict, to game mechanics and setting creation. All excellent stuff – and an easy listen. Episode 9 covers Kickstarters and the tribulations involved in getting it right. The discussion covers the highlights and lowlights of crowd funding. Some have learned the hard way, others have learned from the experience. Monte Cook Games gets a mention, as does Feng Shui 2 and Evil Hat‘s Fate Core. In passing, we get a mention that Kickstarters appeal as a luxury and that some people prefer something physical and special. While perhaps some modern gamers might get away with PDF rules and dice apps, others appreciate the accoutrements of gaming found in accessories and supplements. And then All Rolled Up got a mention by Baz, which is a delight (it’s around 42:40 and I paraphrase due to lack of adequate stenography skills). We’re of a vintage where you get a dice set for a game. Not just a dice set for us to use – but a dice set for Deadlands, a different one for Vampire, and a different one for this, and for that. And you’d have a dice bag, and you’d have this that and another. I’ve got special notebooks and special pens. None of us are afraid of spending money on this kit because a hobby ain’t a hobby until there’s kit involved. […] You know the guys (sic) at All Rolled Up, who make the really luscious dicebags and all of the kit and accessories, absolutely have seen a fantastic gap in the market that really wasn’t being serviced. It’s for people like ourselves who have got to the stage where we’ve got a few quid in the bank… we’ve got less time than we used to, but we’ve got a couple of quid and we’re more than happy to spend it on things like that to kind of enhance our gaming experience. 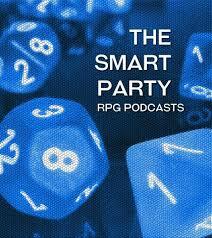 I thoroughly recommend that you drop in on The Smart Party and have a listen. The podcasts have been a lot of fun to listen to and raised a fair share of interesting points. Well worth you giving up your ear(s) for the time it’ll take to catch up.